Do you sometimes wonder if your little efforts could possibly make any difference at all? Consider a simple example from nature. Your simple, daily acts of service matter, and this charmingly illustrated little book will lift your heart as it demonstrates the power of many righteous people working together to fill the world, one drop at a time, with the sweet truths of the gospel. A really great talk and perspective! I would refer this book to my friend Celest. I honestly believe the perspective of working like the honey bees will progress the work because of the unified effort and best work from the members combined, regardless, we are all missionaries. We do not need a tag to tell us that. We do not need to be reminded that a member is a missionary. Let's take the counsel from our Heavenly Father and work unified as brothers and sisters because that is what our Heavenly Father will have us to do. I am grateful for the insights given, especially the great counsel I know came from the Lord. Also, it's a quick and easy read! It is a beautiful book visually and in message; however, it bothers me that there is a misspelled word (conference on pg. 10). With a book that isn't as limited in words as this one and one which is not designed to be a visual feast, it wouldn't be as bothersome. However, with so few words on each page, every word stands out. I'm not sure how this mistake went unnoticed when the book was published, but I çalled Deseret Book Corporate Offices right after I received one of the first copies of this book as a gift and told them about the mistake. It appears the decision was made to continue and sell the book as is. 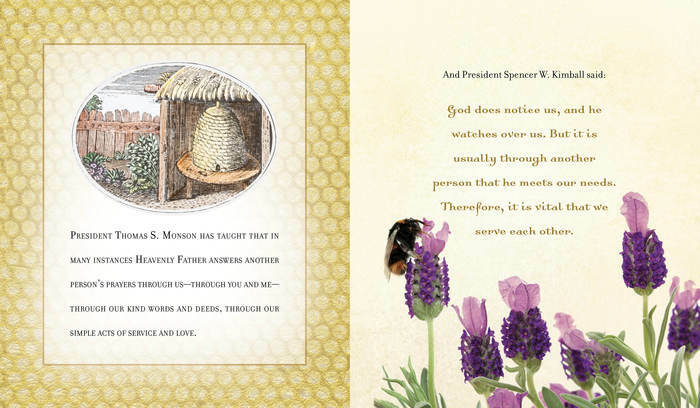 Elder M. Russell Ballard grew up on an orchard and as a boy remembers the hives of honeybees his father kept--over 60,000 bees to pollinate the trees. Each bee only lives a few short weeks to four months and its contribution is a mere one twelfth of a teaspoon. But think of the collective effort each bee makes to the good of the hive. Their life's work is vital and significant when taken as a collective effort. So many of us take for granted the beautiful harmony and system it takes to create each drop of honey. This book is a visual and verse reminder that each of us has contribution to make, however small it may be. We better the world with daily acts of small service and as mothers. We nurture, we build, we work together. I was inspired by the pages and think One Drop At A Time is just the message we each need to remember. My father and grandfather were beekeepers, and I grew up watching each year's cycle of honey production. I was naturally attracted to this beautiful book. The message is timeless and inspirational. 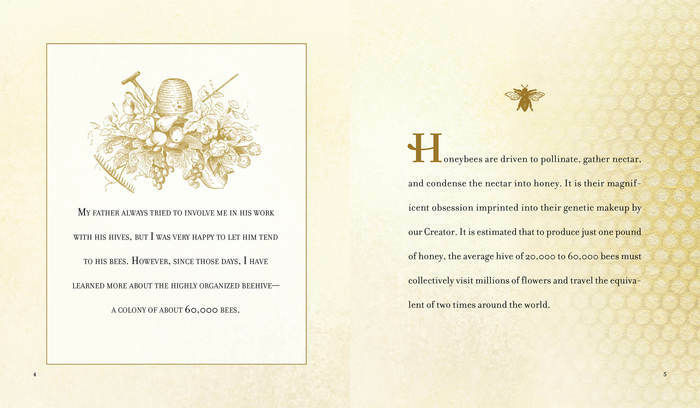 The photography and book design accent the text and help explain the symbolism of the honeybee and hive in the LDS Church. The book is a treasure. This is a terrific carryover by Elder Ballard from his original talk. My wife had left the book on the kitchen table. I just happened to pick it up and read it while eating a peanut butter and HONEY sandwich...the first one I'd eaten in many years. This was more than a coincidence and I knew it was one of those "meant to be" moments. Sure enough, I didn't leave the table until I'd finished the book. And though the book was written for women, it absolutely is beneficial to any man who has a sweetheart in his life, as I do. 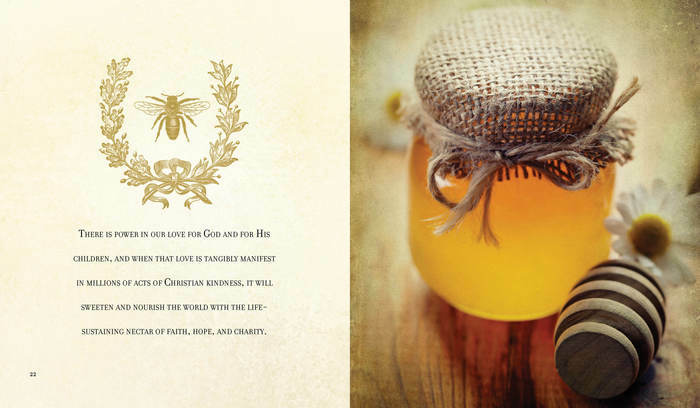 My wife had also purchased the bottled honey at Deseret Book. And yes, that sandwich was made from that special honey. Coincidence? I don't think so. Since then, I've had a PB & Honey sandwich each day (from that same jar, which doesn't seem to empty) and I've also referred back to that book each time. Highly recommended to any man who loves peanut butter and honey sandwiches and has a wonderful woman in his life. I found this book to be a beautiful feast for the eyes as well as nourishing to the soul. Occasionally we all need a reminder of how important we are in building up the kingdom of God. This book was a welcome respite in my otherwise over-burdened day. Do you sometimes feel that your efforts don't matter? Did you know that one bee only gathers a mere 1/12 of a teaspoon in its short lifetime? But if you magnify that by a whole hive of bees you get the incredible honey that helps sustain life. if all of us do a little we can accomplish much! Bees depend on each other ~~ we too must depend on each other. We must truly convert to the Lord and to the gospel. How do we make that change? Read page 32 to find the one simple daily practice that will make the difference in your life and in the life of the others around you. This book was taken from the talk Elder Ballard gave in General Conference Oct 2012 and beautiful pictures have been added to strengthen the message and make this a book to be treasured.